On a moonless summery night in Malibu, California, the beach is mostly quiet. The surfers and sunbathers left hours ago and only a handful of people amble near the pier, talking quietly and watching the waves roll in. Another small group approaches the shoreline. They turn away from the others, away from the dry sand and the pier, and toward the lagoon where the high tide washes over the beach and no humans are in sight. The four of them—Karen Martin, a marine biologist, her husband Doug Martin, and student researchers Olivia Le Sage and Danilo Martinez—are on a mission, and they don’t want to be disturbed. During the day, Malibu Lagoon State Beach draws crowds as a premier surfing destination. The city is only 53 kilometers from Los Angeles and renowned for its sandy shores and celebrities. When the sun is out, bright umbrellas and beach towels cover the sand, glamorous sunbathers lounge amid sandcastle-building children, and beachcombers stroll the water’s edge. Shorebirds wade in search of snacks, detached pieces of giant kelp float toward shore, and surfers bob on their boards, scanning the sea for the perfect ride. But tonight, Malibu’s coast is transformed, the tide so high that the state beach’s eponymous lagoon is indistinguishable from the ocean. Martin and her students wade undeterred through deep puddles to a distant, flooded area—they’ve got work to do. As they move away from the sounds of traffic and the muffled voices of other visitors, an eeriness settles over the beach; fog blankets the rolling hills lining the coast, and the water reflects the lights of Los Angeles and its suburbs to the southeast. The researchers shiver beneath their layered clothing and crashing waves soak their legs, but they’re in their element. They take turns peering through Martin’s night vision monocular. They’re excited when they spot a black-crowned night heron, which is standing in the cold water for the same reason as they are: in hopes of spotting the mysterious California grunion. Only a handful of grunion show up as silvery glints in the sand. These fish must be “scouts,” Martin and her students agree. It’s their term for the first few grunion to come ashore on the night of a predicted run. Often on the scouts’ heels are hundreds of their peers, but something about tonight’s conditions deters them from their silvery, squirmy gathering. Grunion are unremarkable in appearance—they are about the size and color of sardines—but stand out for their unusual mating ritual in spring and summer. The fish inhabit the coast between Baja California and San Francisco Bay, riding in on the waves during especially high tides. A few grunion test the area and, if conditions are right, scores of grunion congregate on the wet sand to mate en masse. If males are present on the sand, female grunion will linger. They half-swim, half-wriggle onto the beach, drill down into the soft sand using their tails until just their pointy heads are visible, and lay between 1,600 and 3,600 bright-orange eggs in clutches beneath the surface. Male grunion curve around the burrowing females and release their milt, which percolates through the sand to fertilize the eggs. Both females and males then catch outgoing waves back to sea, although the males return to shore several times a night to fertilize clutches. The females only lay eggs once per run. But they’ll have several opportunities to do so each season: runs may occur once a night over four nights following new or full moons between March and August, the season of exceptionally high tides known as spring tides. 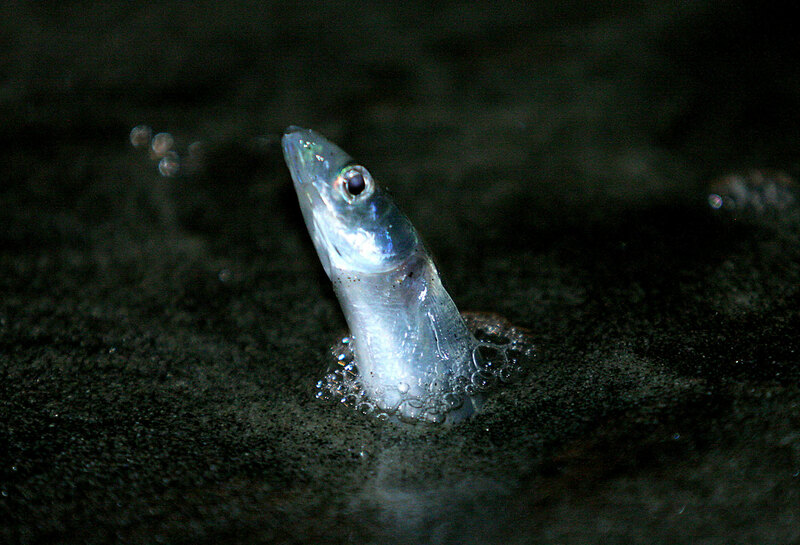 Grunion prefer to mate just as the peak tide ebbs. The outgoing tide deposits an additional layer of moist sand on the eggs. They remain 10 to 20 centimeters under the sand for about 12 days, when another high tide rolls in, agitates the eggs—a cue to hatch—and pulls them into the ocean with the receding waves. Any eggs left behind can remain viable in the sand for a total of 35 to 40 days and hatch during a future high tide. Grunion may be exhibitionists in their mating habits, but they spawn unpredictably, and they’re elusive when in the water. As a result, scientists know little about them. Martin has been on a 20-year mission to change that, through fieldwork and by studying grunion eggs and embryos in her lab at Malibu’s Pepperdine University. A native of landlocked Oklahoma, the scientist was as surprised as anyone that she became a marine biologist—she originally studied respiration in amphibians for her master’s thesis at Oklahoma University. When she moved to California to pursue her doctorate, “something went wrong,” she jokes. Martin met her first grunion with her son’s Cub Scout troop on a field trip to observe a run. She was hooked on the mysterious little fish. In the broadest sense, grunion runs are predictable: they occur at night, in the spring and summer, and when the tide is at its highest. But the specifics of events are still a puzzle. How do the scout fish decide on the beaches most suitable for a run? What determines the size of the run, which can range from a measly showing of 10 or so fish to thousands of writhing grunion covering the sand? And why have they been pushing their range slowly northward in recent years? The grunion are most abundant in El Niño years and don’t run at all if the weather is truly terrible—pouring rain, heavy and pounding surf, and storms put them off. Excessive light or noise also deters the fish, Martin says. Even when considering those factors, it’s difficult to guess whether the grunion will run at a particular location on a particular date. “There are nights when we’re out there sometimes and we’re like, ‘This is perfect, where are the fish?’” says Martin. Plus, few people study grunion and the mating rituals occur on beaches across a wide swath of California and Mexico, making them difficult to monitor. To solve that problem, Martin began recruiting volunteer monitors in 2002. More than 5,000 citizen scientists have learned how to collect data on grunion runs at their local beaches, which are scattered along the fish’s roughly 1,000-kilometer range. She calls them the Grunion Greeters. Local marine science organizations train citizen scientists to collect run data. Volunteers use an illustrated guide to rank the size of a run from zero (the presence of one or two scout fish, no spawning) to five (a beach so full of spawning fish that it’s impossible to walk through the area without stepping on them). The volunteer-collected data is incomplete and spotty, but has allowed researchers to see trends over time—and Martin says the grunion population appears to be on the decline. During the summer of 2018, Martin shared the data with Ben Holt, a research scientist in physical oceanography at NASA’s Jet Propulsion Laboratory (JPL), to puzzle out the frustratingly durable mystery of what influences the runs. Holt acted as research advisor for the NASA DEVELOP team that compared Grunion Greeter data with NASA’s satellite data on ocean conditions: surface temperature, algal blooms, chlorophyll-a levels, and the presence of either El Niño or Pacific Decadal Oscillation conditions, predictable patterns of ocean variability. The team discovered that grunion runs tend to be larger when chlorophyll-a concentrations are high. Chlorophyll-a levels are a proxy for phytoplankton, which are consumed by zooplankton, which are thought to be consumed by grunion, explains Alexandra Jones, a NASA JPL intern and recent graduate of Pennsylvania’s Temple University. The takeaway? 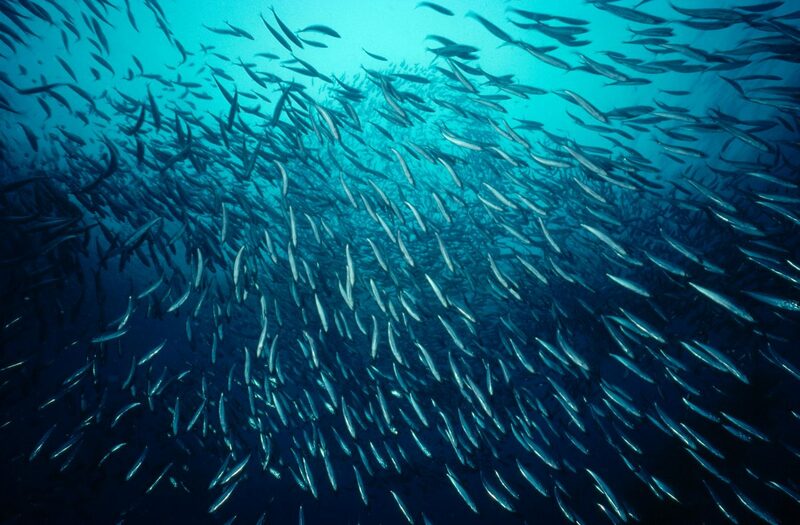 Grunion appear to mate in larger numbers when there are plenty of snacks around. Holt’s lab also noticed a correlation between water temperature and the size of grunion runs. In warm, Southern California, the runs tend to be smaller when water temperature exceeds 18 ˚C, Jones says. Run sizes are larger if the ocean temperature hovers at 18 ˚C. “We believe that the grunion prefer a specific water temperature range, and changing water temperature along the coast of California is the main driver for their northward migration,” Jones writes in an email. 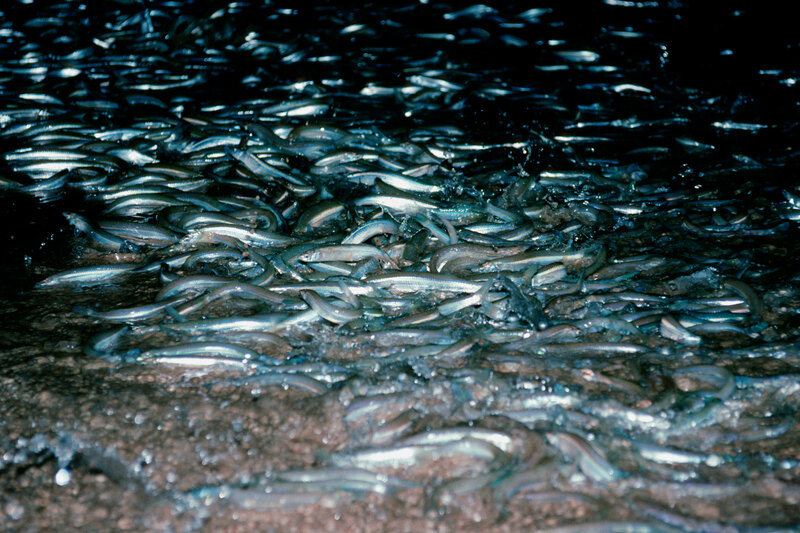 The most northerly reports of grunion were from the central California city of Monterey, until Martin received anecdotal reports in 2005 that the fish were showing up farther north. After identifying grunion larvae from a tidal pool in the Port of Oakland, in the San Francisco Bay Area, around 200 kilometers north of Monterey, she expanded the Grunion Greeters program to the Bay Area. Martin is searching for more information about this range extension. In August, a colleague collected eggs for Martin from a beach well north of San Francisco Bay, scooping the clutches and surrounding sand into plastic baggies, with the goal of hatching grunion in the lab. In September, just after the end of mating season, Martin and Le Sage meet in the lab. 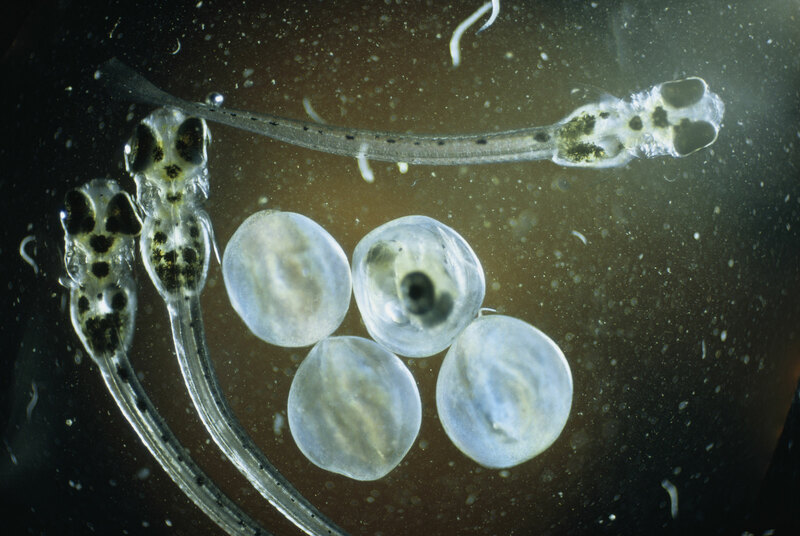 The translucent eggs are like miniature space capsules, Martin observes, tiny worlds where the fish embryos can survive until external conditions are appropriate for them to emerge. They can last as long in the laboratory as they do in the sand; the only maintenance they require is the occasional spritz of salt water. The researchers drop a few eggs on a petri dish to examine them under a microscope. If all is well within an egg, the scientists will see a pulsating patch of pink: the embryo’s beating heart. With a pipette in one hand and a mechanical tally counter in the other, Martin and Le Sage begin hatching the eggs by transferring them into petri dishes filled with salt water and gently shaking the dishes to simulate waves. Soon there are delighted murmurs. 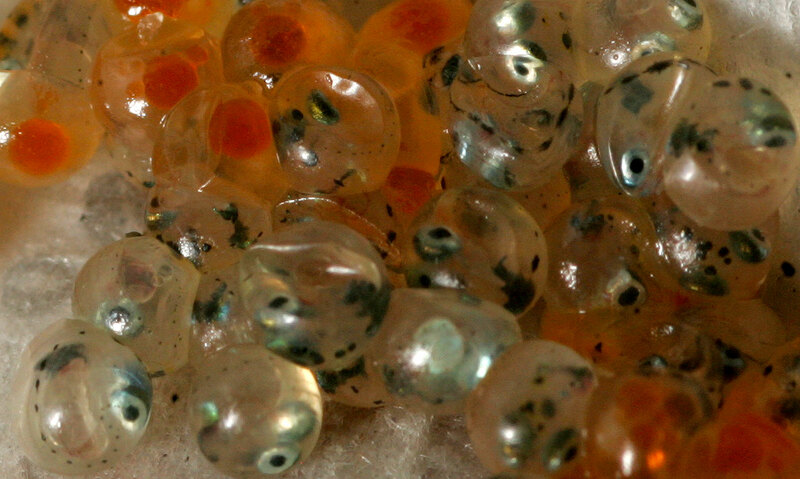 A higher than expected number of fish emerge, a welcome surprise given that hatch rates decline over time and the eggs had been stored for over 30 days, at the limit of their viability. Compared with eggs from the grunion’s historical range, the northern eggs are just as robust, says Martin. This finding bodes well, since her previous research showed that the northern grunion have struggled as juveniles and adults: compared with their southern counterparts, they are smaller, die sooner, and reproduce less successfully. The resilient eggs and the grunion’s expanded range could be good news, a hint that the species is adapting to a changing environment, but moving north appears to come with its own set of troubles. North or south, cool or warm waters, the grunion face another ever-present threat: humans. Indigenous people harvested grunion in the past—researchers have found grunion otoliths (ear bones) at archaeological sites—but these days the fish are rarely on anyone’s menu. Collecting the fish by hand during certain months is legal and some people catch them to eat but most catch grunion for bait—or fun. Thousands of fish breeding on the beach is a spectacle, and modern-day grunion runs spawn more wild parties than hunting expeditions. Southern Californians flock to the beach at night to grab grunion and stuff them into buckets, often with no idea what to do with the fish once they’ve collected them. The beachgoers are frequently intoxicated, talking loudly, and stumbling along the sand in flip-flops and swimwear. and no woman at all. A few days after the tranquil Malibu lagoon visit, Martin tries to work amid chaos during a small grunion run near Santa Monica. The beach isn’t crowded, but the people present seem intoxicated and beg Martin, her husband, and me to join them for an ocean swim. (We decline.) As the prospective swimmers strip off their clothes and ask apprehensively if we’ve seen any sharks, a couple of kids scoop up the few grunion that have come ashore to spawn. They run to their father and hold the squirming creatures up to him, grinning. He instructs them to put the fish into a bucket of water, looking a bit perplexed, as if it has occurred to him that he has no idea what to do next. Martin approaches him and suggests, gently, that he release the grunion back into the ocean. In that bucket, she explains, they will soon die. The father promises that he will return the fish to the sea after the family has had a chance to observe them. To run barefoot on the sand at night, waves rolling over your ankles and water pooling around your feet, among an otherworldly presence—living silver—understandably evokes an enchantment that few seem to know what to do with today. Throw in alcohol, or a childhood light on nature, and the desire to sprint and scream and wave flashlights and grab at the grunion makes sense. They’re fascinating because they exist so far outside of people’s experience. The grunion run enchants Martin too, but she’d rather admirers express themselves in ways that will preserve the grunion for generations to come. Kelly Catalfamo is a freelance journalist based in Los Angeles, California. She enjoys writing about ... well, anything, and her curiosity has driven her to cover everything from ancient Swedish folklore to the intersection of butchery and painting. 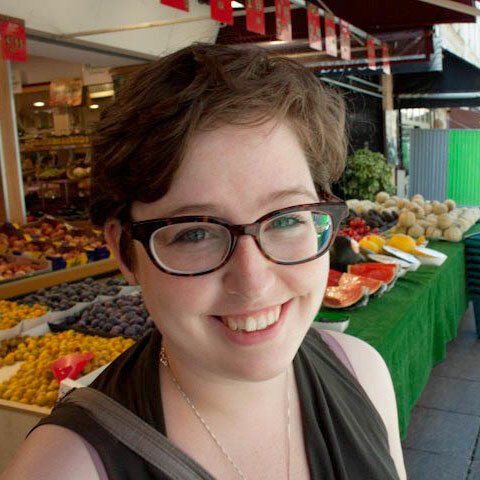 Her work has appeared in Atlas Obscura, Scalawag, The Associated Press, The Day, and elsewhere. Cite this Article: Kelly Catalfamo “Hey Beacher, Leave Those Fish Alone,” Hakai Magazine, Feb 12, 2019, accessed April 25th, 2019, https://www.hakaimagazine.com/features/hey-beacher-leave-those-fish-alone/.